Are Any Of The Remaining Daily Getaways Deals Worth Buying? The US Travel Association has been promoting their “Daily Getaways” deals for the past month, and we’ve seen several good deals on things like hotel points, discounted gift certificates, and Las Vegas packages. While the most popular deals generally sell out within minutes, some of the other packages are still available. The promotions technically end on May 20th, but could of course sell out earlier, so if you’re interested in one of these packages I’d purchase sooner rather than later. So with a specific plan in mind, buying IHG points through Daily getaways can be a great deal, but I of course wouldn’t make a speculative purchase here. Loews offered several different suite packages through Daily Getaways, and there are two remaining. There were only five of each package available to begin with, so I don’t imagine there are many remaining. These packages are valid for stays between June 1, 2016, and June 30, 2017. The exception is the Loews Miami Beach, where the packages are only available January 1 through June 30, 2017, since the hotel is being renovated this year. There are some blackout dates, though the promotion terms don’t specify what exactly they are. Presumably they won’t be super restrictive, unless you’re trying to travel the week of Christmas/New Years. While these can be a good deal for a specific person, I don’t see either of these getting much traction with the miles and points crowd. While $1000 for a suite in New York that generally sells for over $2500 is certainly a phenomenal deal, there are plenty of hotels in New York, and myriad ways to book them. I am not an expert on Universal, but these prices seem a little high. Our Costco has annual passes for Universal Hollywood for $109 (granted, with blackout dates), but that alone suggests there are probably more creative ways to buy park tickets if you don’t need a four pack. If there are four of you traveling though, and over peak dates, this could be a good value. I’d stay away from this one, honestly. Daily Getaways is advertising $525 for a 5-night stay at any Diamond Resorts property worldwide. However, there are only 71 participating properties, none of which I’ve heard of previously, and none of which look particularly nice. Many of these hotels are also listed on online travel sites for less than $105 per night, so I don’t think this is a deal. Omni offered several combinations of discounted hotel stays during Daily Getaways, and there is one package remaining for 2 nights at a Select Omni Hotel for $245. If you have trips planned to these cities this could represent a nice savings, but the restrictions kill this one for me. 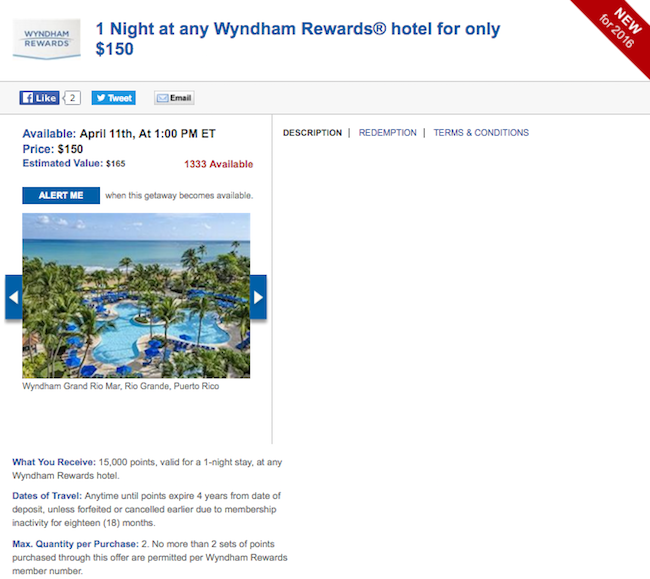 While advertised as one free night at any Wyndham property, you’re really buying 15,000 Wyndham Rewards points with this deal. The points are deposited directly into your Wyndham Rewards account, and those points are valid for up to four years from the date of deposit. However, 18 months of account inactivity can cause those points to expire prematurely. While Wyndham does have some nicer properties in the Wyndham Grand collection, the best value here is likely on the low end. As Travis has detailed, Wyndham’s Go Fast allow you to redeem 3,000 Wyndham points and a variable amount of cash for the majority of their properties. This means you can get a hotel for as little as $58 — not a particularly nice hotel, certainly, but if you have a summer road trip or are visiting places with limited hotel options, this is worth checking out. Which credit card should I use for Daily Getaways purchases? In the past there were additional discounts for using American Express cards, but this year you can use any card and receive the same rate. The other thing to keep in mind is that Daily Getaways purchases are processed by Daily Getaways, and not the program from which you’re buying points. In other words, if you’re using this promotion to buy IHG Rewards Club points, your purchase will be processed by Daily Getaways and not by IHG (therefore it doesn’t count as hotel spend). However, Daily Getaways is categorized as “Travel – Travel Agencies” in their own right, so you’ll want to use a card that gives you bonus points on travel. None of the remaining Daily Getaways are killer “must buy now” packages, but in the right circumstances these can still be some compelling offers. If you’re interested in one of these deals, I’d certainly pick it up sooner rather than later! Did you end up purchasing any Daily Getaways deals? Which ones? @Tiffany — love how you broke these down. By motto: if nobody’s buyin’, maybe you shouldn’t. Correction–high end Intercontinentals now go for 60,000/night after the latest IHG devaluation. Not a compelling offer at all from IHG. I agree with @Tommy Trash about the IHG deal. I had been pricing out the Intercontinental in Sydney for a stay in September. It’s 55k points if I wanted to redeem points, or $229 if I paid cash. The Daily Getaway deal would net me 50k points for $293. In the end, I switched to the Park Hyatt Sydney at 30k points. The only worthy use of Wyndham is for it’s highest-end properties since they all go for 15K points. In the US a couple in Manhattan and the one on South Beach in Miami are worth the $150 price x2. Got two $100 Marriott gift certificates for $80 each. That will be a quick $40 in my pocket (e-mail said it could take up to 14 business days for delivery, but actually received them both the next business day). Tried for the larger amount Marriott gift certificates but they were sold out almost instantly. We vacay annually at the ICH Hua Hin for a sweet rate of 35K IHG points per night and it’s an awesome seaside Resort & Spa. No tax, service charge, or resort fees to worry about. Other great properties are HI Resorts in Phuket (2 of them) and one on Phi Phi island that go 25K-35K IHG points. Not too long ago, InterContinental Phnom Penh was going fast on PointBreaks for a bargain 5K points per night. There are many other gems in the haystack if you search around … I bought 300K points in this year’s Daily Getaways sale.